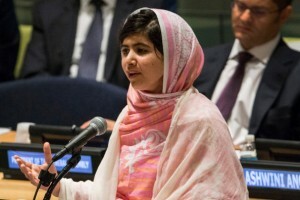 Malala Yousafzai, the 16-year-old Pakistani advocate for girls education, speaks at the United Nations Youth Assembly on July 12, 2013 in New York City (Photo Credit: Andrew Burton/Getty Images). Last Friday, the world watched in awe as Malala Yousafzai addressed international leaders and youth on her 16th birthday at the U.N. General Assembly. Her message was clear: protect the right to education for young people across the world. I was fortunate to witness this historic moment along with 500 youth delegates representing more than 80 countries. In the lead up to #Malaladay, youth leaders worked tirelessly to draft a youth resolution on education. This collaborative initiative was led by the Youth Advocacy Group and the resolution was amended by hundreds of youth delegates. In this effort, Amnesty International youth delegates and other youth asserted the need to include human rights language in the final document of the Youth Resolution. This measure was vital in strengthening the youth resolution and establishing a human rights framework for addressing the education emergency. These efforts culminated in Malala delivering the youth resolution to U.N. Secretary General Ban Ki-moon as part of the world’s first ever U.N. youth takeover. This was a major milestone for our generation in demanding and shaping the advancement of human rights. As Malala finished speaking, the General Assembly erupted in cheers. Her speech was followed by an unforgettably powerful serenade of the entire youth delegation singing “Happy Birthday” to Malala. 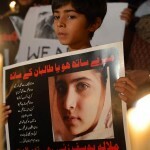 This moment captured the spirit of this event and the resilience of Malala Yousafzai: it was a moment celebrating Malala’s life in a sense that the Taliban would have never envisioned some nine months earlier. The remainder of the day included breakout sessions, workshops and discussions among youth delegates as we debated effective methods to advance the right to education. Amnesty International delegates engaged youth leaders in highlighting the security and violence barriers to education, and the ongoing blockade of the Gaza Strip, as well as Amnesty’s efforts to ensure access to education worldwide. #Malaladay was an immense success and a compelling remainder that much advocacy is still needed to establish universal education. This entry was posted in Children's Rights, Middle East and North Africa, United Nations, Women's Rights and tagged economic social and cultural rights, gender-based discrimination, human rights defenders, Middle East and North Africa, pakistan, United Nations, women's humans rights defenders by Guest Writer. Bookmark the permalink. it is very important now atdays, because you would be payed for 'Education', while someone is stirring at you as if you shouldn't 've that. "while, essentially, the them 'Education' isn't, who is to & who is to not." Impressive tips and concepts I ever seen here after reading this site,keep doing in the same way with paper writing help site. Mostly about education development and students knowledge increasing purpose,thanks. There is no underestimating the power of education in influencing major world decisions. The resolve of these youth delegates at the UN General Assembly was a clear message to the world leaders that education needs to be made accessible to all young people. The courage exhibited by the youth delegates in presenting the amended youth resolution on education to the UN Secretary General, Ban Ki Moon is a direct statement that education empowers our youth. With the penetration of education to all youth in the world, it is possible to have a wealth of writers that will enable custom writing help to reach even a larger audience.